Each January, while most of us are cursing the calories from the holidays or are digging out from a surprise winter snowstorm, the staff at Daniel Stowe Botanical Garden is working to bring some color and form into our lives. Luckily they have a collection of some 10,000 orchids to help out. They also call on artists who invariably are as varied as the orchids themselves. This year the garden is combining the best from its orchid collection with striking photographs, in the aptly named exhibition Art & Orchids: Flowers in Focus. It’s at the Garden through March 12 and is free with garden admission. Striking color, natural symmetry, unmatched variety, and graceful and flowing lines make orchids one of the world’s most-photographed flowers. So it made sense this winter for the Garden to pair its orchids with the work of three outstanding North Carolina photographers. Asheville’s Julie McMillan presents a contemporary exhibition on metal. 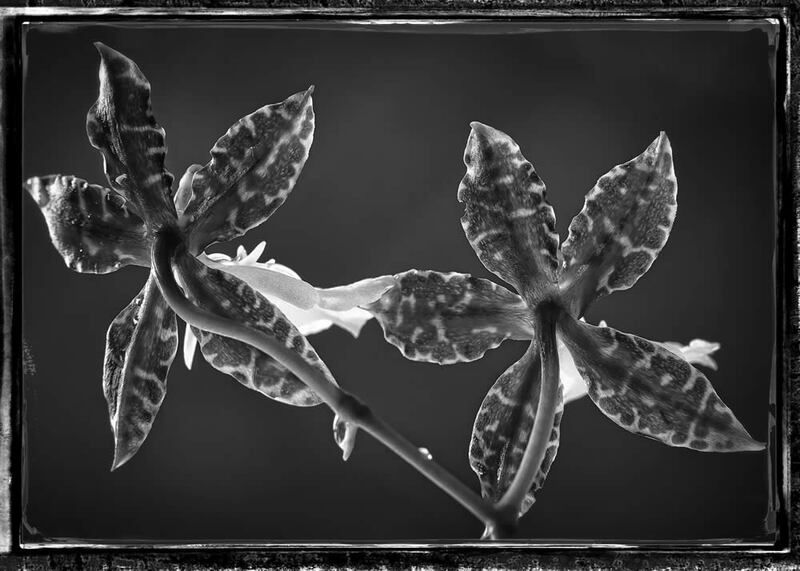 Rick Haithcox, of Dallas, has staged a study of form and structure in black and white. And Greg Allikas, who recently moved from Florida to Brevard, presents a traditional look at award-winning orchids. All the work is available for purchase. The garden’s horticulture staff worked to develop a theme based on putting ever-greater focus on the form, color and structure of orchids. They’ve created a horticultural display that begs even the novice photographer to stop in their tracks as they tour the garden’s 8,000-square-foot glasshouse. The photography exhibition includes the distinct work of the three photographers. Garden guests are greeted first by the work of Gaston County’s own Rick Haithcox, who spent with months photographing the garden’s orchids in his Dallas studio. The result is framed watercolored prints with light coffee tones. 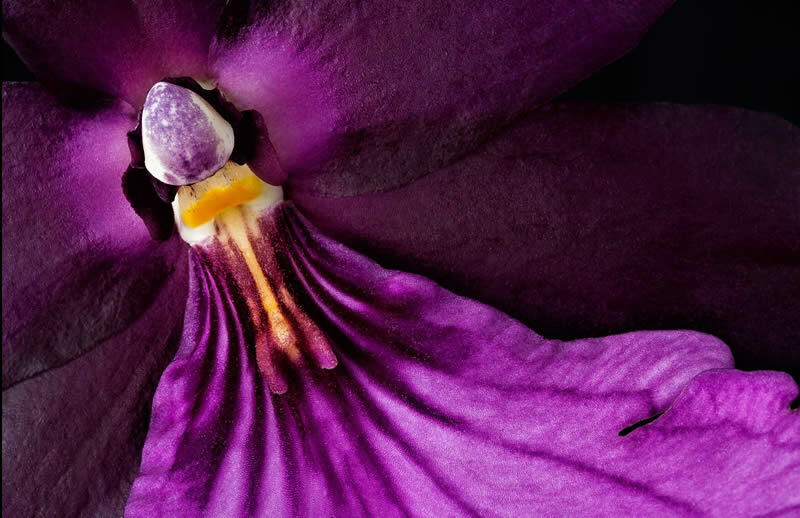 Greg Allikas, takes a different approach in many of his photos of orchids he has shot largely at highly- respected contests conducted by the American Orchid Society. Possibly the most unusual presentation is of Julie McMillan’s photos. She prefers to print her work on metal through a process called dye sublimation in which a digital image is transferred and bonded directly with a specially coated aluminum sheet. It’s ideal for displays in damp areas such as The Orchid Conservatory. “I like to exhibit this way because there is nothing between the image and the eye of the viewer,” McMillan says. A commercial photographer in Palm Beach and orchid grower for 28 years, Greg Allikas is the awards photographer for West Palm Beach Judging Center and several annual south Florida orchid shows including Miami, Delray Beach and Deerfield Beach. His photos have been featured in numerous AOS publications and a series of posters he designed and produced. He serves on the AOS Information Committee. Numerous career awards include Grand Prize 13th World Orchid Conference photo contest. He is a member of the Tropical Orchid Society. Greg is the proprietor of the popular Orchid Photo Page and O zone online. He recently moved to Brevard. current home city of Asheville as well as Charlotte and New York City. She has been the awards photographer for the Western North Carolina Orchid Society for a number of years. She and her husband are long-time active members of the WNCOS. Dallas, NC commercial and fine art photographer Rick Haithcox has operated his business in this area since 1987. He has earned a well-deserved reputation as one of the finest black and white portraiture and fine art photographers in the region and his resume also includes both corporate and industrial photographic work for a varied list of clients that includes regional, national and international organizations. He has won numerous awards from the North Carolina Association of Professional Photographers, Professional Photographers of America, the Light Factory in Charlotte, and others. Feb. 28 from 2 to 5 p.m. The event is free with regular admission. Wine expert Kimberly Forrests, of Johnson Brothers will also conduct a wine tasting. A cash beer and wine bar with specials on flights will also be available. Orchids are among the most unique flowers in the plant world, evolving to facilitate unusual, complex, and amazing methods of pollination. 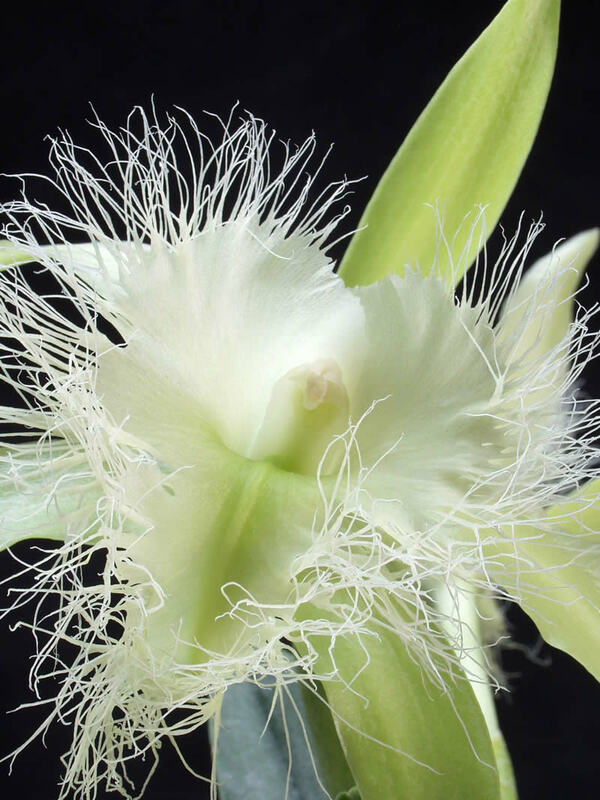 In this class, learn about orchid pollination and observe flower structures. 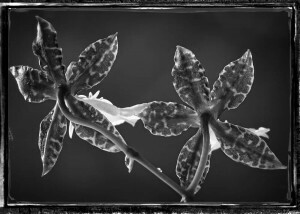 Computer software aided photographer Rick Haithcox in the production of his exhibition of photos on display during Art & Orchids, but it all started with capturing a great image. Rick will share some thoughts about the photos he shot of the Garden’s collection and give guests some tips on how to have success shooting similar compositions in the field. First Tuesday presentations are free with Garden admission or free for members. Bring a lunch! the creativity of children. Hands-on activities, including take-home crafts and other art projects, will be available throughout the Garden. Learn how to grow and succeed with orchids at home. Horticulture staff will discuss tips for growing orchids and demonstrate repotting. Participants will get hands-on experience and leave with two orchids – one that they pot themselves and one already in bloom to enjoy! Instruction provided by Julie McMillan, owner of Silver Birch Studio Photography.